With MAXQDA, temporary combinations of codes can be saved as code sets, permitting the user to group the same code in different ways, or to group frequently used codes in a hierarchical tree structure for increased accessibility. The code sets are linked only to existing codes, meaning that the removal of a code from a set has no further consequences. 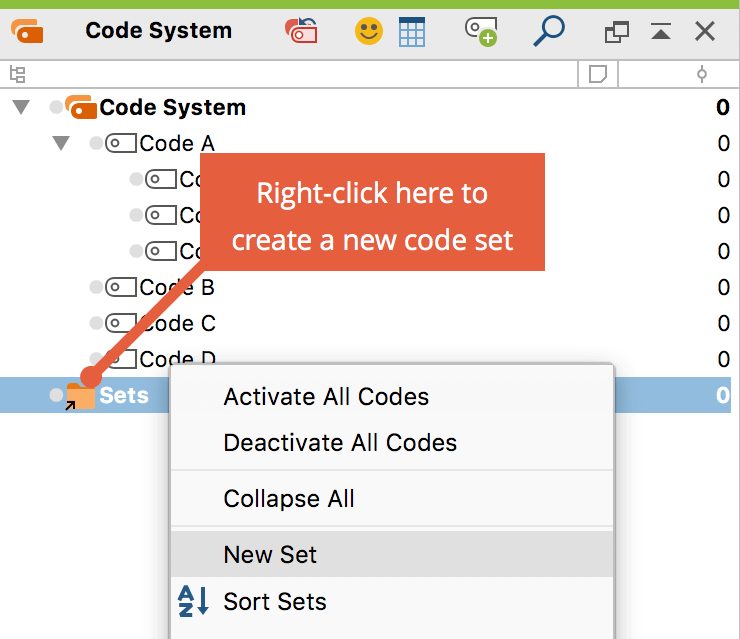 To create a new code set, right-click on the word “Set” in the Code System, then select New set. After you enter a name for the set, you can drag and drop the desired codes into the new set with the mouse. The codes can also be moved within the set or to another set using the mouse. Tip: If you activate codes before you creating a new code set, MAXQDA places the activated codes directly into the new code set.